Working its way through the Alleghany Circuit Court, the curious case of North South Development v. Garden is one of woe—complete with accusations and counter-accusations, a cast of colorful characters, state officials who have deftly managed to duck and cover, and the appearance of merit on both sides of the argument. Virginia anglers tend to come down on the side of the defendants—fellow anglers—who they believe have been railroaded in the case by the plaintiffs. But is North South Development v. Garden really just a case of bluebloods gone bad? Of aggressive anglers who overstepped their bounds and got what was coming to them? Or of something else entirely? Although Dargan Coggeshall’s legal troubles began in June 2010 when he was served with a warrant for criminal trespassing, the saga doesn’t really begin there. Coggeshall, his brother-in-law, and their pastor were fishing in a section of the Jackson River between Indian Draft and Petticoat Junction designated as public property by the state of Virginia. It was the pastor’s first time fishing that stretch of water. The unwitting anglers were fishing a productive section of river when they noticed a woman photographing them and speaking excitedly into what appeared to be a cell phone. Coggeshall shrugged off the experience and returned to his fishing. A few days later, however, he was served with a warrant for criminal trespassing. Matt Sponaugle, who with his father Frank owns North South Development and a community alongside the Jackson River called River’s Edge, had obtained the warrant. The Sponaugles had encountered Coggeshall before: On more than one occasion Matt Sponaugle had confronted Coggeshall while the latter was fishing near his property. Sponaugle insists that he owns property on both sides of the Jackson River and that he therefore owns the riverbed in between (from just below Smith Bridge, a public access point used regularly by anglers and kayakers). Sponaugle had already warned Coggeshall not to fish in portions of the river that River’s Edge had posted as private—an area of about 2 miles of the Jackson. In one such encounter, Sponaugle had even called the Alleghany County sheriff’s office; the deputy, however, had declined to arrest Coggeshall for trespassing because he had stayed in the river and was carrying a valid fishing license. “I didn’t attempt to run when he called the law,” says Coggeshall. “I had already called the Virginia Department of Game and Inland Fisheries (VDGIF), and they told me that as long as I didn’t get out of the river, I was within my legal rights to fish in that section of the Jackson River.” Coggeshall left that day but continued to fish in the river after the confrontation. What Coggeshall, his brother-in-law, and his pastor didn’t know was that the woman who photographed them in the river that day was Karen Feldenzer, wife of Dr. John Feldenzer, a talented and prominent surgeon from Roanoke, Virginia. The Feldenzers had recently completed work on their riverside home, on land purchased from Sponaugle that the Feldenzers say came with exclusive rights to the bottom of the Jackson River. As testimony in court revealed, the landowners were convinced Coggeshall’s party was trespassing—and they had the photographs to prove it. 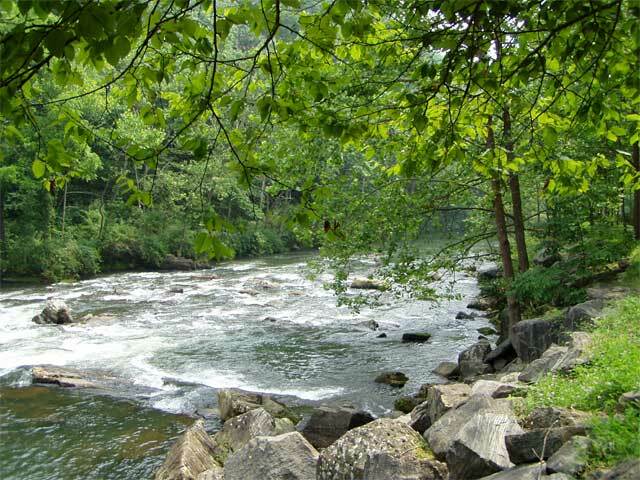 The Jackson River is arguably Virginia’s preeminent trout stream for several reasons. Situated in the far western end of the state and flanked by what passes for mountains in the Old Dominion, the Jackson lacks significant development along much of its path. The river winds its way past old family farms and through forests until it meets the Cowpasture River and creates the headwaters of the James River. The Jackson is quite wide and deep in many places and stands alone as the single Virginia trout stream large enough to support driftboat angling. But it’s the thriving population of hard-fighting wild brown trout, originally stocked by the state, that keeps anglers coming back. It may come as a surprise to many to learn that this trout population wouldn’t be what it is today were it not for the Gathright Dam. Completed in 1979, the Gathright Dam was originally built for flood control and to provide drinking water for Richmond. According to its environmental impact statement, the dam was also supposed to provide a public downstream fishery to mitigate the loss of the public upstream fishery, which disappeared when Lake Moomaw was created as a result of the dam. The dam was itself controversial—as dams often are—but it was eventually built with federal tax dollars. Before the dam, the Jackson River held primarily warmwater fish like bluegill and smallmouth bass; after the dam, the cold water downstream of it gave birth to a world-class trout fishery. Though some locals have long considered the Jackson River private water—and courts in decided a few previous lawsuits in support of this notion—the Army Corps of Engineers deemed the Jackson River a navigable waterway (much to the dismay of said landowners). Virginia law has long deemed navigable rivers public property because they were used as commercial routes even before roads and railways. So when in 1982 the federal district court ruled in favor of the Army Corps of Engineers in Alexander v. Lovering, the Jackson River became more or less publicly owned. The Corps of Engineers made a review of the legal question and is of the opinion that the Jackson River is a navigable stream. Therefore, title to the riverbed is deemed to be vested in the Commonwealth of Virginia, not with private riparian owners. 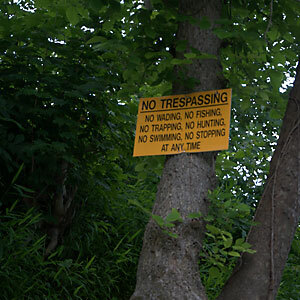 Thus, riverbed lands up to the ordinary highwater mark are deemed to be public lands thereby permitting fishermen to wade or boat the stream up to that point without risking private trespass. Conversely, some landowners believe that title to the Jackson River bottom is vested with the riparian owners. Eventually, it may be necessary for judicial determination. So can the Jackson River be privately owned? Apparently the answer is yes. In its landmark Kraft v. Burr decision, the Virginia Supreme Court sided with riparian owners who argued that their centuries-old king’s crown grants—given to their ancestors by the King of England and obviously predating Virginia law because the grants predate the country itself—gave them exclusive rights to the river. Virginia law stipulates that all land not already conveyed is held in trust by the Commonwealth for the people of the Commonwealth. But again, the Court noted that the land—and river usage—in question in Kraft v. Burr had indeed already been conveyed. While anyone may float through the “crown grant section” of the Jackson, no one may fish their without the expressed permission of the landowners. VDGIF maps of the Jackson River clearly mark the crown grant section and note that anglers may not fish in it, even with a valid state license. The disputed water of North South Development v. Garden lies outside of the designated crown grant section of the Jackson—and therein lies the rub. The Sponaugles claim to have a crown grant to the section that is just as valid as any other, but the VDGIF says that the water is public and authorities will not arrest anyone fishing there legally. So who is right? The Sponaugles, who have lived in Alleghany County for decades, are respected business people with significant land holdings in the county. Among these is River’s Edge, a 46-acre site that the Sponaugles have subdivided into approximately 33 homesites, which range in price from $215,000 to $365,000 each. Some of these sites offer Jackson River frontage. The Feldenzers own two adjoining homesites in the development and spent three years building their riverfront home there. The Feldenzers say that their deed extends into the river, and county tax officials confirm that they and the Sponaugles are paying taxes on the river bottom. Indeed, part of the plaintiffs’ argument appears to be that the fact that they are made to pay taxes on their total acreage is proof of their ownership of and exclusive right to the river. For their part, the plaintiffs in the case believe that their private property rights have been violated. They are surprised by the animosity expressed toward them by those not involved directly in the dispute. In truth, it should come as no surprise to anyone that North South Development v. Garden may have broad repercussions: Anglers worry that a ruling in favor of the plaintiffs could embolden landowners alongside any of Virginia’s colonial-era rivers to begin posting their banks and confronting anglers. Can you trust that VDGIF sign or map that says that you’re fishing on public property? Let us say that you err on the side of caution and decide to research crown grant property to ensure that you don’t trespass. Unfortunately, no such central database or repository exists. And yet landowners on such rivers as the Jackson, James, York, Elizabeth, and Shenandoah may be holding such grants. How can they prove that they own the river bottom? They can sue you. The Jackson River imbroglio has outraged anglers and vexed riverside landowners alike—but in truth, both parties are ill-served by the status quo. Some have directed their wrath toward the VDGIF, which really isn’t to blame either. The sad truth is that the Commonwealth apparently has no mechanism for recognizing these crown grants short of a lawsuit. Many had expected the Virginia Attorney General’s Office to weigh in on the case on behalf of the defendants because Coggeshall was fishing in water the state deems (and posts as) public; nevertheless, Attorney General Ken Cuccinelli has steadfastly refused to do so. Indeed, the Attorney General’s Office claims to lack the authority to recognize a crown grant: Though Sponaugle sent a variety of documents to Cuccunelli’s office in a bid to prove his ownership of the riverbed, he was told that only judicial recognition would do. In other words, Coggeshall is being sued precisely because the plaintiffs can only establish what they believe to be their property rights through such means. In general, Virginia politicians have been loath to involve themselves in the case. But the issue isn’t going anywhere: Matthew Pickett, a college student at the Rochester Institute of Technology in New York, recently made a documentary film about the case for entry in a competitive film festival this fall. In the meantime, a summary judgment in North South Development v. Garden is expected quite soon—and may be a first step back to the Virginia Supreme Court. Regardless of the ultimate outcome of the case, it is difficult to see how anyone wins. Both plaintiffs and defendants feel aggrieved, both feel that their disparate rights have been violated—and both are caught up in the quiet desperation of a situation that is apparently beyond any ordinary citizen’s ability to mediate.